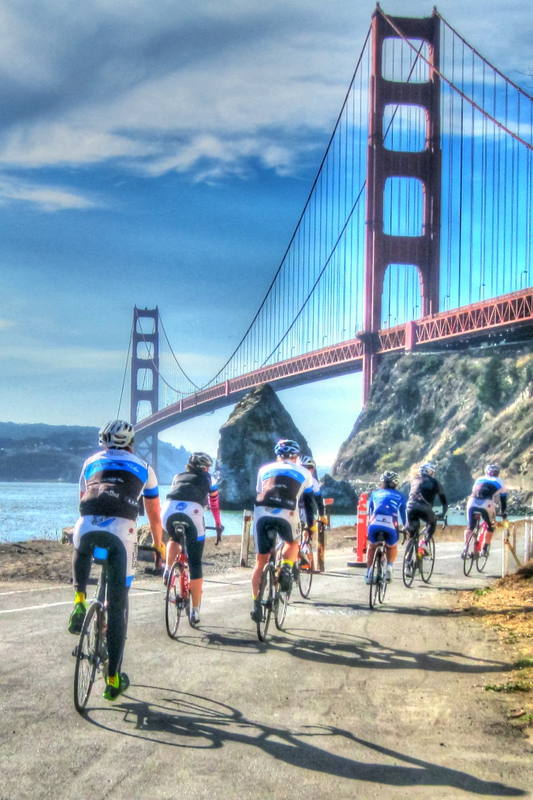 The Amgen Tour of California starts this Sunday in Santa Rosa. As you can imagine, all of us cyclists are already giddy with excitement and anticipation. Part of the reason is that since the race starts here all of the teams have to arrive early. Most of the 16 teams had all arrived by Wednesday so there are pro cyclists all over Sonoma County’s roads. There are also many “meet and greet” opportunities as local bike shops hosts events. So, what’s a weekend warrior cyclist like me supposed to do when faced with all this pro cycling awesomeness? You guessed it. I took a couple of days off just so I could make some of the events and in general act like a groupie. Here is just a sampling of some of the cool things that have happened so far. On Wednesday, I got the call I’d been expecting from my friends at Riviera Ristorante. I’ve mentioned what a cycling mecca they’ve become so I assumed one or more teams would eat dinner there one night. Sure enough, on Wednesday, the Omega Pharma-Quick Step (OPQS) team was in the house so Sherry and I, along with my newest cycling buddy John and his wife Cheryl, all ate in the presence of some of the world’s greatest cyclists. The plan for Thursday was to hit the road, on bike of course, and see if I could get lucky. My plan? I watched Facebook activity and it looked like some of the teams were heading north. I did the same. Except I waited for a couple of hours to see if I could catch them as they headed back into town. It worked as I was rewarded with passing a few OPQS riders, including the sprinting sensation Tom Boonen, the entire Argos-Shimano team, and few riders from Team Rabobank. Thursday night it was time to meet a few of these riders up close and personal and there was definitely no shortages of opportunity. Here’s a short list of the events I knew about that were happening around Sonoma County. I choose to head over to NorCal Bike Sport to meet the riders from OPQS since this is the current team of local cycling hero Levi Leipheimer. It is also the team of Tom Boonen. There are two other important reasons for my selection. First, NorCal Bike Sport is a sponsor of my cycling club so I want to support them. But, more importantly, Sherry has wanted to meet Tom Boonen ever since she first starting following the wonderful world of cycling. As you can tell from the photo, she got her opportunity. What’s in store for today? More riding the back roads of Sonoma County with one hand on the handle bars and the other holding a camera. Then it’s off to the Santa Rosa Soiree tonight, which is the official team presentation gala. Tomorrow will be a team ride on the first 30-mile loop of Stage 1 followed by some time watching the Junior National crits to check out the up and coming talent. Sunday will be all about hanging downtown on race day. So, stayed tuned next week to hear how this all turned out. In the meantime, I have to get ready for my ride.